It was an honor to meet and talk with Grace. The signing went well for her, she had many conversations that left her listeners with special thoughts and feelings. Grace Mattern’s poetry and short fiction have been published in numerous literary journals and magazines, including The Sun, Calyx, Prairie Schooner, Poet Lore and Yankee. She received a Poetry Fellowship from the New Hampshire State Council on the Arts and was the first recipient of the Jean Pedrick Memorial Fellowship for a residency at Vermont Studio Center. Her chapbook, Fever of Unknown Origin, was published by Oyster River Press in 2002 and her first full-length collection, The Truth About Death, was published in April by Turning Point Books. Over the past thirty five years, Mattern has been deeply involved in the movement to end violence against women, serving as Executive Director of the NH Coalition Against Domestic and Sexual Violence until June, 2011, and participating on statewide and national boards. She can be found online at www.gracemattern.com. On February 2nd at 10:30am, local author Buddy Fife will be at Chesley Memorial Library to talk about his book "Growing Up A Country Boy. 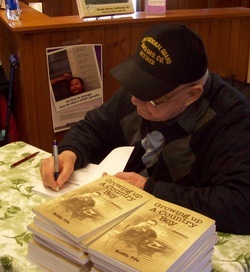 The turn-out for Buddy Fife's book signing on Saturday Feb 2nd was a huge success. Numerous friends, family and library patrons all attended. Lively conversations reminiscing about local happenings were shared as books were signed by the author.